Contest: A fun, interesting or surprising fact about you! 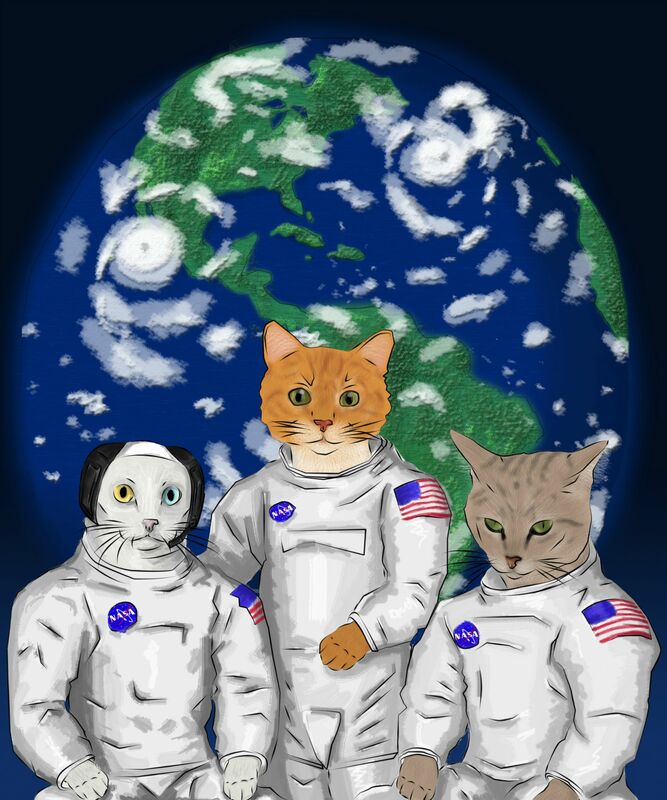 Update: Brett is the winner of this contest, his space cats drawing is incredible and received the most votes. The fun fact with the most kudos will get a special prize, so give kudos to the replies that tickle you the right way, and don't forget to share your fun fact below. Remember, the more we learn about each other, the easier it gets to find awesome creations we can build together. An amazing tradition we have had at Optimizely since we were a team of less than 15 is having each new hire share a fun fact about themselves at the end of their first week at our weekly company all hands meeting. As small as it sounds, this has sparked so many great conversations, and has acted as an incredible means of fostering some incredible collaboration. In this spirit, I thought it would be fun to invite all of you to share something about yourself that may be surprising. As the middle child in a family of seven kids, my parents put me in gymnastics at an early age. For reasons unknown, I took to it right away, and to many of my colleagues and hopefully your suprise, I was actually good enough to make the Junior National Team at age 13. While I've lost most of it by now, I can still be caught occasionally doing the one of handstand or throwing an impromtu back flip (under the right conditions). Now its your turn, Optiverse! Share with us. My fun fact: I speak Yoruba fluently. Yoruba is a Nigieran language spoken by about 30+ million people. Because of this skill, I am somewhat of a YouTube sensation. My most popular video has almost 200,000 views. Search the web for my Yoruba moniker, "Titilayo Oyinbo" (or white Titilayo) and you'll see me. P.S. I can say I've witnessed Jodie's random back flips and even a stroll around the office on his hands. @CK-Matthew - I know you have a fun fact to share, can you tell us here? @Experimentalist - I want a photo! My Fun Fact: While most people use physical materials for their art, I tend to go the digital route. Mainly because I am lazy and hate mixing paint. I perfer to draw using just a computer mouse(no tablet) to make digital paintings. And I often like to give myself interesting themes for inspiration. For example: What would the Presidents of the United States look like if they were dinosaurs? I also take fun requests from friends, such as this one titled 'Space Cats'. My fun fact: is when living on the Gold Coast, I had a scooter that I used to go from my house to the beach everyday, which was awesome but I really wanted to be able to take my dog with me as well. So to the embarrassment of my girlfriend and pure amusement of on lookers, I got a front baby carrier (like a backpack you wear on the front) and would ride around with BB strapped to my chest, wind in her face....will upload a pic when back at my computer. I wore a tutu in order to raise money to build a fresh water well in an Ethopian village. Met my wife during her last week of undergrad. Still kicking my, perosnal undergrad-can down the road, I chased my soon to be vet-student girlfriend (at the time) to Scotland. There we both studied, along side one another for 4 years, loving everyone moment in Edinburgh. From there we climbed in the highlands, set up a relief mission in Swaziland, acted as a Euro-base for our continent-bound friends and brought home our first Scottish Terrier. There I worked as a consultant to the Scottish Government, providing ad-hoc economic development studies, often called to session in parliament as expert advisor Now happily married, we've added to our Scottish tribe with a second Scottie and two more cats! While the Harold & Kumar movies did widen their exposure, most people outside the southern or midwestern United States haven't heard of the fast food restaurant White Castle, let alone eaten at one. They are actually the oldest hamburger restaurant in the country (founded in 1923) and the inventors of the slider. They have very strong social marketing and call their fans "cravers." A few years ago they started a nationwide essay contest for their fans to describe how much they love White Castle, with the grand prize being induction into the Cravers Hall of Fame. Lucky for me I found out about this in their frozen packages, which is all we get in California. In July of 2012, I said what the heck. and sent in a short description of some of my anecdotal experiences at White Castle. Given that they were long past and I lived in California now, roughly 2,000 miles from the closest White Castle, I figured I had no shot. White Castle was also clever in not describing the full extent of what induction meant, so I didn't spend much time thinking about it. White Castle notified all the inductees' local newspapers and filmed video interviews for their own corporate marketing campaigns. Below I've attached a picture of the essay I wrote and the plaque with all our names on it. All in all it's quite a silly story, and they haven't responded to my requests to begin building White Castles in California yet.